I. F. Stone (Isidor Feinstein Stone, December 24, 1907 – June 18, 1989) was a politically progressive American investigative journalist, writer, and author. He is best remembered for I. F. Stone's Weekly (1953–71), a newsletter ranked 16th among the top hundred works of journalism in the U.S., in the 20th century, by the New York University journalism department, in 1999; and second place among print journalism publications. 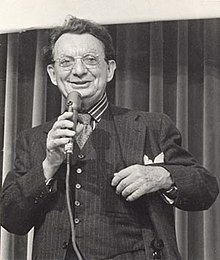 I. F. Stone was born in Philadelphia, Pennsylvania, to Jewish Russian immigrants who owned a shop in Haddonfield, New Jersey; the journalist and film critic Judy Stone was his sister. Stone attended Haddonfield High School. He was ranked 49th in his graduating class of 52 students. His career as a journalist began in his second year of high school, when he founded The Progress newspaper. He later worked for the Haddonfield Press and for the Camden Courier-Post. After dropping out of the University of Pennsylvania, where he had studied philosophy, Stone joined The Philadelphia Inquirer, then known as the "Republican Bible of Pennsylvania". Influenced by the socially aware work of Jack London, Stone became a politically radical journalist, and joined the Philadelphia Record (the morning edition rival of The Philadelphia Inquirer) owned by J. David Stern, a Democrat. Stone later worked for the New York Post newspaper after Stern bought it during the Great Depression (1929). In late adolescence, Stone joined the Socialist Party of America, a political decision influenced by his reading of the works of Karl Marx, Jack London, Peter Kropotkin and Herbert Spencer. Later, he quit the Socialist Party due to the intractable sectarian divisions, ideological and political, that existed among the organizations that constituted the American Left. In 1929 Stone married Esther Roisman, who later worked as his assistant at I. F. Stone's Weekly. Their marriage produced three children (Celia, Jeremy and Christopher), and after sixty years ended with his death in 1989. The editor of The Nation magazine, Victor Navasky, said that plain, solid work characterized Stone's investigative journalism. He was an old-school reporter who did his homework and perused public-domain records (official government and private-industry documents) for the facts and figures, the data and quotations that would substantiate his reportage about the matters of the day. I made no claims to 'inside stuff'. I tried to give information which could be documented, so [that] the reader could check it for himself ... Reporters tend to be absorbed by the bureaucracies they cover; they take on the habits, attitudes, and even accents of the military or the diplomatic corps. Should a reporter resist the pressure, there are many ways to get rid of him. ... But a reporter covering the whole capital on his own — particularly if he is his own employer — is immune from these [political] pressures. The journalistic professionalism and integrity of I. F. Stone derived from his intellectual willingness to scour and devour public documents, to bury himself in The Congressional Record, to study the transcripts of obscure congressional committee hearings, debates and reports. He prospected for news nuggets — published as boxed paragraphs in his weekly newsletter — such as contradictions in the line of official policy, examples of bureaucratic mendacity and political obscurantism. Stone especially sought evidence of the U.S. government's legalistic incursions against the civil liberties and the civil and political rights of American citizens. In 1937, advised by a newspaper editor — who told him that his political reportage would be better received if he minimized his Jewishness — Stone changed his professional journalistic byline from Isidore Feinstein Stone to I. F. Stone. Years later, Stone acknowledged being remorseful about having changed his professional name, thereby yielding to the systemic anti-Semitism then prevalent in American society. Personally, Stone spoke of himself as "Izzy" throughout his life and career. In 1933, Stone worked as a reporter for the New York Post newspaper. He supported the politics of U.S. President Franklin Delano Roosevelt (FDR) (1933–1945), especially the progressive reforms of the New Deal (1935–1938) programs FDR was instituting in order to rescue the U.S. economy from the poverty imposed by the economic depression which started in 1929. In his first book, The Court Disposes (1937), Stone criticized the politically reactionary role of the U.S. Supreme Court in blocking the realization of the socio-economic reform programs of the New Deal. In the course of working as publisher and reporter, Stern and Stone quarreled about journalism, its practice and its practices, especially about the content and tone of Stone's New York Post editorials critical of a business plan to refinance the public transit system of New York City. After an acrimonious bout of quarreling, Stern became worried about Stone's juvenile attitude and sent a note to Izzy and to the managing editor, informing them that, henceforth, the reporter I. F. Stone was part of the news-department staff. In 1939, after leaving the New York Post, Stone worked for The Nation, first as associate editor and then as its Washington, D.C., editor. Two years later, in the book Business as Usual: The First Year of Defense (1941), Stone reported the inefficient planning and execution, and the business-as-usual attitude, of the industrial and business monopolies — and its toleration by the U.S. military — that resulted in the tardy production of matériel for the Arsenal of Democracy with which President F. D. Roosevelt said the U.S. would help Europeans and Asians combat the totalitarianism of Nazi Germany, fascist Italy and Imperial Japan, in the Second World War (1939–45). In the matter of war-production employment, Stone's exposé of the institutional racism and anti–Semitism of the FBI's process for vetting job applicants is evident in the semantics of questions meant to discover, identify and exclude political subversives from civil service in the U.S. government. The questions the FBI asked about job applicants were ideological and bigoted, such as, "Does he mix with Negroes? ", "Does he ... have too many Jewish friends? ", "Does he think the colored races are as good as the white? ", "Why do you suppose he has hired so many Jews?" and "Is he always criticizing Vichy France?" — a poor question to ask during an anti-fascist war in which collaborationist Vichy France (1940–44) actively participated in the Nazi occupation as the Nazi puppet régime of France. To the mainstream American reader concerned with the affairs of daily life, Stone reported that, "Questions like these are being used as a sieve to strain anti-fascists and liberals out of the government. They serve no other purpose.":192–193. Readers thanked The Nation for Stone's informing the public of the FBI's racist, fascistic and anti-Semitic un–American activities. Concomitantly, the right wing criticized Stone for maintaining the anonymity of his FBI sources. In 1946 Freda Kirchwey, the editor (1933–55) of The Nation, fired Stone from the magazine for accepting employment with the newspaper PM (picture magazine) as a foreign correspondent covering the anti–British Jewish Resistance Movement in Mandatory Palestine (1920–48), where the Jews awaited the foundation of the State of Israel. The Sykes–Picot Agreement (1916) facilitated the transformation of the British Mandate of Palestine (1920–48) into the State of Israel (1948), which was meant to be a bi-national country of Arabs and Jews. Stone was the Washington, D.C., correspondent for PM, and published a series of feature articles about the Jewish European refugees who ran the British blockade to reach Palestine. He later further developed that reportage and wrote the book Underground to Palestine. In 1948 Picture Magazine closed, and was replaced in Stone's career first by the New York Star and then by The Daily Compass, published until 1952. They have been kicked around as Jews, and now they want to live as Jews. Over and over I heard it said: 'We want to build a Jewish country ... We are tired of putting our sweat and blood into places where we are not welcome. ... ' These Jews want the right to live as a people, to build as a people, to make their contribution to the world as a people. Are their national aspirations any less worthy of respect than those of any other oppressed people? As a secular Jew, I. F. Stone agreed with the nationalist aspirations of Zionism and publicly supported the State of Israel (1948), before the U.S. government granted official recognition. As a politically moderate Zionist, and like the politician Abba Eban, Stone supported the one-state solution of Israel as a bi-national state that Palestinian Jews and Palestinian Arabs would inhabit as equal citizens. Yet, in observing the military conquest that established Zionist rule in Mandatory Palestine, as an American, the reporter I. F. Stone became sympathetic to the Arab resistance to their physical dispossession (jobs, homes, land) and the political disenfranchisement (voided civil and political rights), which were the rules of social inferiority imposed upon the Palestinian Arab inhabitants of Israel. Stone's reportage of the Israeli expulsion of the Arabs from Palestine angered Minister Eban, both for embarrassing him (a politically moderate Zionist) and his government and for dimming the international public image of the State of Israel as a refuge for oppressed peoples. In 1974, in speaking of differences of opinion among Jews about the philosophy and practice of Zionism, Noam Chomsky quoted Abba Eban: "I do not believe that any argument ... can probably change the convictions of Noam Chomsky or of I. F. Stone, whose basic complex is one of guilt about Jewish survival". The Sykes–Picot Agreement (1916) established the imperial spheres of influence of France (blue), Britain (red) and Russia (green) in the former Ottoman Empire (1299–1922). After WWII (1939–45), that partitioning of the Middle East facilitated the establishment of the State of Israel (1948) within the Mandate of Palestine (purple). The geopolitics of the Russo–American Cold War (1945–90) extended the Arab–Israeli conflict (1948 to date) beyond Palestine. Israel is a transformed country. What was once a struggling country is now a thriving country. Economically, it's booming. It will win — it's prepared for war and will win, you know, the next war, or the next war after that, militarily ... But there will be wars and wars and wars until Israel comes to terms with the Palestinians ... [because] the road to peace lies through the Palestinian refugee camp. Consequent to the establishment of British, French, and Russian imperial spheres of influence in Asia Minor, by way of the Sykes–Picot Agreement (1916), the internal politics of the State of Israel became the Arab–Israeli conflict (1948 to date), which the West conflated to the geopolitics of the Cold War (1945–90) with each belligerent party, the U.S. and the U.S.S.R., claiming hegemony over the Middle East. In the book review article "Holy War" (Les Temps Modernes, June 1967), Stone said that superpower geopolitics are of secondary importance to the discontent of the Arabs and the Jews in the Levant. In The Hidden History of the Korean War, 1950–51, Stone said that South Korea had provoked North Korea to war, by way of continual guerrilla attacks across the border (38th parallel) into the north of Korea, and that, thus goaded, the North Koreans eventually counterattacked, and invaded the South, providing the official casus belli (June 25, 1950) required for Korean reunification. That such cross-border attacks, authorized by the South Korean government, were part of the U.S. foreign policy for the worldwide containment of communism, advocated by John Foster Dulles, realized in the field by General Douglas MacArthur, U.S. commander in the Pacific Ocean military theater, and countenanced by Syngman Rhee, the strongman President of South Korea. Although Stone had been a mainstream journalist in the 1930s, appearing on shows like Meet the Press (then a radio show), in 1950 he found himself blacklisted and unable to get work, possibly because Stone publicly admitted to his "fellow traveler" tendencies. In 1953, inspired by the example of the muckraking journalist George Seldes and his political weekly, In Fact, Stone started his own independent newsletter, I. F. Stone's Weekly. Over the next few years, Stone's newsletter campaigned against McCarthyism and racial discrimination in the United States. In 1964, using evidence drawn from a close reading and analysis of published accounts, Stone was the only American journalist to challenge President Lyndon B. Johnson's account of the Gulf of Tonkin incident. During the 1960s, Stone continued to criticize the Vietnam War. At its peak in the 1960s, the Weekly only had a circulation of 70,000, but it was regarded as very influential. Articles originally published in I. F. Stone's Weekly later were compiled and published in The I. F. Stone's Weekly Reader (1973), and in three of six volumes of A Noncomformist History of Our Times (1989), a compendium of Stone's writing. During the 1930s, as a left-wing journalist, Stone criticized Joseph Stalin's brutal consolidation of power in the U.S.S.R. in an editorial for the New York Post (December 7, 1934), that denounced and likened Stalin's purge and execution of Soviet citizens to the political purges and executions occurring in Nazi Germany (1933–45). That Stalin's régime in Russia had adopted the tactics of "Fascist thugs and racketeers". :65 As the sham justice of the Moscow Trials (1936–38) proceeded, Stone attacked Stalin's action as heralding a new Thermidor, which was the time of counter-revolution and reaction against the French Revolution (1789–99). :66 Stone also criticized Lenin and Trotsky for their "cruel and bloody ruthlessness" in deposing Tsarist autocracy in Russia. He scolded the U.S. Trotskyists for believing that Trotsky would have been less repressive than Stalin. :65-66 Personally, as a man of the political Left, Stone bitterly denounced the Molotov–RIbbentrop Pact (1939), in public and in private, as a betrayal of Leftist political principles. :78-79 Nonetheless, his American patriotism and professional integrity were doubted, and I. F. Stone was suspected of being a secret agent of the U.S.S.R. In The New Independent newspaper, Andrew Brown reported that the Soviet Embassy attaché, KGB Major General Oleg Kalugin, said that, "We had an agent—a well-known American journalist—with a good reputation, who severed his ties with us after 1956. I, myself, convinced him to resume them. But, in 1968, after the invasion of Czechoslovakia ... he said he would never again take any money from us." In "How Many I. F. Stones Were There? ", Herbert Romerstein, formerly of USIA and of the HUAC, and Ray Kerrison reported that Gen. Kalugin had identified I. F. Stone as the secret agent of whom he [Kalugin] had spoken with the journalist Andrew Brown. Eight years later, in The Venona Secrets (2000), Romerstein and Eric Breindel (editorial page editor of the New York Post) developed Kalugin's allegations about I. F. Stone being a secret agent for the U.S.S.R. In "The Attack on I. F. Stone", Andrew Brown said that when he "used the phrase an agent, to describe someone who turned out to be I. F. Stone", he understood the term metaphorically, meaning someone who was a "useful contact", and that the expression "take any money" referred to the fact that the journalist I. F. Stone would not permit a Soviet embassy employee to pay for a luncheon meal, neither then nor in the future, despite earlier lunches in the 1930s and 1940s. That, in September 1992, at the Moscow Journalists' Club, General Kalugin had explained to the lawyer Martin Garbus that, "I have no proof that Stone was an agent. I have no proof that Stone ever received any money from the KGB, or the Russian government, I never gave Stone any money and was never involved with him as an agent." In "Who's Out to Lunch Here? : I. F. Stone and the KGB", Cassandra Tate said that the alleged evidence of Stone's secret agent involvement with the KGB is based upon a few lines of text at the end of a speech by a KGB officer. She concluded that I. F. Stone was neither a Soviet agent, nor a collaborator of the KGB in the U.S. In "Izzy an Agent", D. D. Guttenplan said that the available evidence indicates that the American journalist I. F. never was a witting collaborationist of the KGB, yet left open the ambiguous, semantic matter of the KGB's definition of the term "agent of influence". In other interviews, Kalugin contradicted Romerstein's allegation that I. F. Stone was a Soviet secret agent. Two biographers of I. F. Stone reported General Kalugin's third-party denials that Stone was a Soviet secret agent. Myra MacPherson (All Governments Lie! The Life and Times of Rebel Journalist I. F. Stone, 2006) reported that Kalugin said: "We had no clandestine relationship. We had no secret arrangement. I was the press officer [of the Soviet embassy in Washington, D.C.] ... I never paid him anything. I sometimes bought lunch. ";:326 and D. D. Guttenplan (American Radical: The Life and Times of I. F. Stone, 2009) reported Kalugin's denials in The Nation and in the New York Post. Whatever the consequences, I have to say what I really feel, after seeing the Soviet Union, and carefully studying the statements of its leading officials. This is not a good society and it is not led by honest men ... Nothing has happened in Russia to justify cooperation abroad, between the independent Left and the Communists. Stone's published statements, about the U.S.S.R., its regimented society, and its totalitarian government, by the Communist Party of the Soviet Union (CPSU), provoked hundreds of subscribers to cancel their subscriptions to I.F. Stone's Weekly newsletter. Kalugin said that he persuaded Stone to continue having working-luncheons with him, but that, after the Warsaw Pact invasion of Czechoslovakia (Operation Danube, August – September 1968), Stone refused to let Kalugin pay for the lunch, and consequently ceased meeting with him. In 1995 the National Security Agency (NSA) published documents from the Venona Project (1943–80), a counter-intelligence program for the collection and decryption of KGB and GRU telegraph messages, collected from 1943 to 1980. On September 13, 1944, the KGB station in New York City transmitted a message to Moscow that Vladimir Pravdin, an NKVD officer working undercover as a reporter for TASS (the Telegraph Agency of the Soviet Union), had sought to communicate with a Soviet agent code-named BLIN, in Washington, DC, but that BLIN had been avoiding a meeting with Pravdin, claiming that his work schedule did not permit the requested meeting. He reported that Samuel Krafsur, an American NKVD agent codenamed IDE, who worked for TASS in the building that housed Stone's office, had tried to "sound him out, but BLIN did not react." The Venona project transcript No. 1506 (October 23, 1944), indicated that Pravdin had succeeded in meeting with secret agent BLIN, and that he was "not refusing his aid" but explained that had "three children, and did not want to attract the attention of the FBI" and that BLIN's reluctance to meet Pravdin derived from "his unwillingness to spoil his career" because he "earned $1,500.00 per month but ... would not be averse to having a supplemental income." In the article "Cables Coming in From the Cold" on the Venona Project transcripts, Walter Schneir and Miriam Schneir said that interpreting the transcriptions is difficult, because of the hearsay nature of the messages; the many steps between a conversation and the sending of a cable; language-translation difficulties; the possibility of an imperfect decryption; and concluded that "the Venona messages are not like the old TV show 'You Are There [1953–57], in which history was re‑enacted before our eyes. They are history seen through a glass, darkly." In their Cold War history, Venona: Decoding Soviet Espionage in America (2000), John Earl Haynes and Harvey Klehr said that Stone was the Soviet secret agent BLIN. They cited four Venona cables that mentioned the American journalist I. F. Stone and that two of the cables contained evidence of Stone's pro–Soviet espionage. As well, the files of the KGB, from 1936 to 1939, indicate that Stone was a Soviet secret agent, who worked as a talent spotter, as a courier to other secret agents, and that he provided private and journalistic information to KGB, and Stone collaborated with the Communist Victor Perlo group, who gave him materials for use in journalistic exposés. Moreover, in The Venona Secrets: The Definitive Exposé of Soviet Espionage in America (2000), Herbert Romerstein and Eric Breindel re-published the allegation that the American journalist I. F. Stone was the Soviet secret agent BLIN. As evidence, they cited Stone's statement, in a column (November 11, 1951) that responded to New York Herald Tribune reportage about his left wing sympathies, and that he would be unsurprised to read in that newspaper, "that I was smuggled in from Pinsk, in a carton of blintzes". That Stone's use of the word blintzes (pancakes) betrayed his knowledge of the word BLIN, his code name as a Soviet secret agent. In the event, the biographer Myra MacPherson said that the FBI never identified BLIN as being I. F. Stone, and, instead, suspected Ernest K. Lindley, who also was father to three children. The FBI claimed that secret agent BLIN must have been someone "whose true, pro–Soviet sympathies were not known to the public ...", hence, could not have been the journalist Stone, who, on the contrary, far from being "fearful", did not hide his left wing beliefs. Indeed, rather than wishing to avoid FBI attention, as BLIN reportedly did, I. F. Stone made a point of suggesting to the Soviet press attaché Oleg Kalugin that they have lunch at Harvey's, a favorite haunt of FBI director J. Edgar Hoover, in order to "tweak his nose". In Spies: The Rise and Fall of the KGB in America (2009), Klehr, Haynes, and Alexander Vassiliev, formerly of KGB, cite a KGB file [which Vassiliev saw in the Soviet Union] that named "Isidor Feinstein, a commentator for the New York Post" in the 1930s, as being secret agent BLIN, who "entered the channel of normal operational work" in 1936. That a note listed BLIN as an agent of the KGB station in New York City, in 1938. Klehr, Haynes, and Vassiliev said that Stone "assisted Soviet intelligence on a number of tasks, ranging from doing some talent spotting, acting as a courier, by relaying information to other agents, and providing private journalist tidbits and data [that] the KGB found interesting". That BLIN was to help recruit and support the German resistance to Nazism in Berlin, from 1936 to 1938. Yet the authors admitted that Stone broke with the KGB after the Nazi–Soviet Pact of 1939, and speculate that later Soviet communications with Stone were meant to reactivate their previous relationship. As such, Klehr, Haynes, and Vassiliev conclude that: "The documentary record shows that I. F. Stone consciously cooperated with Soviet intelligence, from 1936 through 1938, [Stone's Popular Front period]. An effort was made, by Soviet intelligence, to reestablish that relationship in 1944–45; we do not know whether that effort succeeded. To put it plainly, from 1936 to 1939 I. F. Stone was a Soviet spy". In the article "Commentary's Trumped-up Case Against I. F. Stone", Jim Naureckas, counters that the allegations of Klehr, Haynes, and Vassiliev, if true, merely indicate that I. F. Stone was "just gossiping", and criticizes them their "nefarious" and "tendentious" magnification of "relatively innocuous behavior" on the basis of one anti–Nazi activity. As for Stone being listed as an "agent" of the KGB, Naureckas said that Walter Lippmann also is listed as a Soviet secret agent. In the article "I.F. Stone: Encounters with Soviet Intelligence", Max Holland said there is no question that I. F. Stone was a "fully recruited and witting agent" for the Soviet Union from 1936 to 1938; yet, admits that Stone "was not a 'spy' in that he did not engage in espionage, and had no access to classified material". In the book review of Spies: The Rise and Fall of the KGB in America (May 25, 2009), D. D. Guttenplan said that "Spies never explains why we should believe KGB officers, pushed to justify their existence (and expense accounts), when they claim information comes from an elaborately recruited 'agent' rather than merely a source or contact". That the authors of Spies distort the report in Venona transcript No. 1506 (October 1944) and never prove that, in 1936, Soviet secret agent BLIN was I. F. Stone. That their allegations merely demonstrate that Stone "was a good reporter", and notes that Walter Lippmann is quoted in Spies as having professional contacts with "a Soviet journalist with whom he traded insights and information." This is the same man [Pravdin] whom Stone is said to have avoided. Nonetheless, the Vassilev notebook shows that Lippman was meeting Pravdin, not to pass the intelligence to him, but rather to find out what the true intentions of the Soviet government were. One of the KGB reports said, "He [Lippmann] is attempting to use his acquaintance with him [Pravdin] to determine our viewpoint on various issues of international politics. He is doing this, of course, very subtly, with the utmost tact. It should be recognized that by attempting to draw 'Sergei' into making candid comments, Imperialist [Lippmann] is sharing his own information with him". As for the conflicting tales, woven by former KGB agent Kalugin, about his relationship with Stone, from 1966 to 1968, Holland correctly notes that 'Kalugin seemed incapable of telling the same story more than once'. Still, this did not keep Holland from repeating the damaging and long-refuted lie that Herbert Romerstein, former HUAC sleuth, developed after talking with Kalugin, that Moscow Gold [sic] subsidized Stone's weekly. Nowhere is there any evidence that Stone took money for anything, except a possible lunch or two. Nor is there any evidence, as Holland points out, that Kalugin was able to plant [news] stories with Stone. In 1971, angina pectoris forced Stone to cease publication of the Weekly. After his retirement, he returned to the University of Pennsylvania, where he had dropped out years before. He earned a bachelor's degree in classical Languages. Stone successfully learned ancient Greek and wrote a book about the prosecution and death of Socrates, The Trial of Socrates, in which he argued that Socrates wanted to be sentenced to death in order to shame Athenian democracy, which he despised. The Trial of Socrates was a New York Times bestseller and was translated into 18 languages. In 1970 Stone received the George Polk Award, and in 1976 he received the Conscience-in-Media Award from the American Society of Journalists and Authors. In 1989, Stone died of a heart attack in Boston at the age of 81. Composer Scott Johnson makes extensive use of Stone's voice taken from a recorded 1981 lecture in his large-scale musical work, How It Happens, completed in 1991 on commission for the Kronos Quartet. The 2008 Democratic presidential candidate John Edwards listed Stone's The Trial of Socrates as one of his three favorite books. On March 5, 2008, Harvard's Nieman Foundation for Journalism announced plans to award an annual I. F. Stone Medal for Journalistic Independence and an associated I. F. Stone Workshop on Strengthening Journalistic Independence. In 2008 the Park Center for Independent Media at the Roy H. Park School of Communications created the Izzy Award. The award goes to "an independent outlet, journalist, or producer for contributions to our culture, politics, or journalism created outside traditional corporate structures" for "special achievement in independent media". On May 6, 2015, the non-profit peace organization, Catalytic Diplomacy, released The Legacy of I.F. Stone, Part One and Part Two, a pair of documentary videos exploring the legacy and influence of I. F. Stone and I.F. Stone's Weekly. In 2016, the film ALL GOVERNMENTS LIE: Truth, Deception, and the Spirit of I.F. Stone was released; a documentary on independent journalism in which the work and principles of I.F. Stone as an outcast journalist articulate the narrative. The entire run of I.F. Stone's Weekly from January 17, 1953 through December 1, 1971, can be accessed through the ifstone.org website, along with many of Stone's speeches and other writings, and the documentary videos The Legacy of I.F. Stone, Part One and Part Two. ^ Weinstein, Henry; Pasternak, Judy (June 19, 1989). "I. F. Stone Dies; 'Conscience of Investigative Journalism'". Los Angeles Times. Retrieved April 14, 2008. [He] published his first newspaper as a New Jersey schoolboy of 14, and proceeded to afflict the comfortable and comfort the afflicted for the rest of his life. He worked for seven newspapers, was Washington, D.C. correspondent for The Nation and wrote 13 books. Although his politics were to the left of center, Stone was best known for a conservative-looking four-page paper, I. F. Stone's Weekly, which he published with his wife, Esther, for 18 years. ^ a b c d e f Flint, Peter B. (June 19, 1989). "I. F. Stone, Iconoclast of Journalism, Is Dead at 81; His integrity was inspiration and annoyance for decades". The New York Times. Retrieved July 21, 2007. I. F. Stone, the independent, radical pamphleteer of American journalism hailed by admirers for scholarship, wit and lucidity and denounced by critics for wrongheadedness and stubbornness, died of a heart attack yesterday in a Boston hospital. He was 81 years old, and lived for many years in Washington. ^ Stephens, Mitchell (March 1, 1999). "Journalism's Greatest Hits: Two Lists of a Century's Top Stories". The New York Times. p. C1. Retrieved May 27, 2009. ^ "Robert MacNeil Report". American Archive of Public Broadcasting. 1975. Retrieved June 4, 2017. ^ Klaidman, Stephen (April 15, 1977). "I. F. Stone Returns to College at 68: Stone Starts A New Career As a Scholar". The Washington Post. Retrieved April 13, 2008. I. F. Stone, a college dropout turned publisher of an incisive Washington newsletter bearing his name, began his academic career rather inauspiciously; he graduated 49th in a class of 52 from Haddonfield High School in New Jersey. ^ "Izzy on Izzy; A Word About Myself". The Website of I.F. Stone. Retrieved March 10, 2017. I had become a radical in the '20s, while in my teens, mostly through reading Jack London, Herbert Spencer, Kropotkin and Marx. I became a member of the Socialist Party and was elected to the New Jersey State Committee of the Socialist Party, before I was old enough to vote. I did publicity for Norman Thomas in the 1928 campaign while a reporter on a small city daily, but soon drifted away from left-wing politics because of the sectarianism of the left. ^ Page, Myra; Baker, Christina Looper (1996). In a Generous Spirit: A First-Person Biography of Myra Page. University of Illinois Press. p. 145. Retrieved August 4, 2018. ^ Guttenplan, D.D. (2012). American Radical; The Life and Times of I.F. Stone (Paper ed.). Evanston: Northwestern University Press. ISBN 9780810128316. Retrieved March 10, 2017. ^ a b c d e f MacPherson, Myra (2006). 'All Governments Lie'; The Life and Times of Rebel Journalist I.F. Stone (Paper ed.). New York: A Lisa Drew Book/Scribner. ISBN 1416556796. Retrieved March 10, 2017. ^ Roger Starr, PM: New York's Highbrow Tabloid, City Journal, Summer 1993. Accessed online March 5, 2007. ^ Nel, Philip. "About the Newspaper PM". The Crockett Johnson Homepage. Retrieved June 21, 2005. ^ John R. MacArthur (2009). "The First Draft of Israeli History". Globe Books. The Globe and Mail. Retrieved June 12, 2011. ^ Voniati, Christiana (February 16, 2009). "Chomsky on Gaza". Countercurrents. Retrieved May 27, 2009. Chomsky, Noam (2004). Middle East Illusions: Including Peace in the Middle East? Reflections on Justice and Nationhood. Rowman & Littlefield. pp. 130–31. ISBN 978-0-7425-2977-9. ^ "American Radical: The Life and Times of I.F. Stone". Democracy Now!. June 18, 2009. Archived from the original on April 15, 2013. Retrieved April 14, 2013. ^ Stone, I. F. "Holy War", New York Review of Books, August 3, 1969, pp. 15–16. ^ Stone, I. F. "Holy War", New York Review of Books, August 3, 1969, p. 14. ^ "FrontPage Magazine – Praising the "Fairness" of an Old Fellow Traveler". Archived from the original on May 12, 2013. Retrieved March 16, 2013. ^ According to Guttenplan, "They liked him on Meet the Press, the original producer of Meet the Press told me, because he was a good needler. He was very good at getting under the skin of sort of pompous guests." One of the people he needled was Dr. Morris Fishbein, the editor of the Journal of the American Medical Association, who accused those supporting national health insurance of being Communists. Stone asked, "Dr. Fishbein, given that President Truman has already spoken out in favor of national health insurance, do you think that that makes him a dangerous communist or just a deluded fellow traveler?" (See transcript of D. D. Guttenplan interview with Amy Goodman on Democracy Now. ). ^ I. F. Stone Weekly Archived 2006-12-31 at the Wayback Machine (sic), Spartacus Schoolnet. Retrieved December 21, 2006. ^ a b c d Cottrell, Robert C (1992). Izzy; A Biography of I.F. Stone. New Brunswick: Rutgers University Press. ISBN 0813520088. ^ Andrew Brown, The New Independent, March 12, 1992. ^ "How Many I. F. Stones were there?". New York Post. July 20, 1992. ^ Romerstein, Herbert; Eric Breindel (2000). Venona Secrets, The. Regnery Press. ISBN 0-89526-225-8. ^ Brown, Andrew. "The Attack on I. F. Stone", New York Review of Books, October 8, 1992. ^ Tate, Cassandra. Who's out to lunch here? I. F. Stone and the KGB Archived September 5, 2004, at the Wayback Machine, Columbia Journalism Review, November/December 1992. Retrieved September 9, 2006. ^ Guttenplan, D. D. "Izzy an Agent? ", The Nation, August 3–10, 1992; Romerstein's letter in response and Guttenplan's "Stone Unturned", September 28, 1992. ^ Kalugin, Oleg. The First Directorate: My 32 Years in Intelligence and Espionage Against the West (1994). ^ a b Cottrell, Robert C. IZZY: A Biography of I.F. Stone. 1993 pp. 189–190. ^ a b c Klehr, Harvey; Haynes, John; Vassiliev, Alexander (May 2009). "I. F. Stone, Soviet Agent: Case Closed". Commentary. Archived from the original on April 24, 2009. Retrieved June 11, 2009. ^ In The Nation article, "Red Harvest" (May 6, 2009), Guttenplan said that "the VENONA messages are real, albeit problematic: the National Security Agency long resisted releasing the Russian texts, and the English versions, in the public domain, include a great deal of tendentious annotation, much of it, apparently, the work of Robert Lamphere, the FBI's liaison to the project. They are also ambiguous—not least about the apparently simple matter of Blin's identity." ^ "Cables Coming in From the Cold", The Nation, July 5, 1999. ^ Venona: Soviet Espionage and the American Response 1939–1957, Part II: Selected Venona Messages on the CIA's website. Table of Contents Archived August 8, 2006, at the Wayback Machine. Retrieved: September 9, 2006. ^ Romerstein, Herbert, and Breindel Eric, The Venona Secrets: The Definitive Exposé of Soviet Espionage in America (2014). Regnery Publishing, November 2000, p. 435. ^ "FAIR Blog » Blog Archive » Commentary's Trumped-Up Case Against I. F. Stone". Fair.org. April 22, 2009. Retrieved June 25, 2009. ^ Max Holland, "I. F. Stone: Encounters with Soviet Intelligence", Journal of Cold War Studies, Volume 11, Number 3, Summer 2009. ^ "Red Harvest: The KGB in America". The Nation. Retrieved June 25, 2009. ^ Haynes, Klehr, and Vassiliev, Spies: The Rise and Fall of the KGB in America, p. 177. ^ Myra MacPherson "Review: Spies: the Rise and Fall of the KGB in America", The Huffington Post, 28 May 2009. ^ "John Edwards' favorite books". Johnedwards.com. Archived from the original on June 15, 2009. Retrieved June 25, 2009. ^ See nieman.harvard.edu, or the "Release notes". On the same day, ifstone.org went public, containing further information on the Harvard project. ^ The Izzy Award, Izzy Award Home Page, Park Center for Independent Media. Retrieved March 19, 2009. Robert C. Cottrell. (1992). Izzy: A Biography of I. F. Stone, New Brunswick, N.J.: Rutgers University Press. ISBN 0813520088. 388 pages. 18 chapters. Notes. Selected Bibliography. Index. Victor S. Navasky. (1980). Naming Names: New York: The Viking Press. ISBN 0-8090-0183-7. Miriam Schneir, "Stone Miscast," The Nation, November 4, 1996. John Earl Haynes, Harvey Klehr, and Alexander Vassiliev, Spies: The Rise and Fall of the KGB in America. (New Haven: Yale University Press, 2009) (ISBN 9780300123906) "I. F. Stone: The Icon" pp. 146–52. Max Holland, I. F. Stone: Encounters with Soviet Intelligence, Journal of Cold War Studies, Volume 11, Number 3, Summer 2009. Weber, Karl, ed. (2006). The Best of I.F. Stone (PDF) (1st ed.). New York: Public Affairs. ISBN 158648463X. Retrieved March 10, 2017. "Armed With Words: D. D. Guttenplan's The Life and Times of I. F. Stone." Review by Tom Robbins in The Village Voice, June 2, 2009. ... to live in interesting times A review by John Whiting which includes audio of Stone's Vietnam Day Teach-In at Berkeley in 1963, and his two-hour public conversation in New York in 1988, sponsored by the New School and The Nation.